Indeed, exploring Huam-dong’s narrow hillside alleyways can be a bit like riding a time machine into days past. Stately houses built in mixed Western and Japanese styles, where wealthy Japanese lived during the colonial era, coexist with smaller, humbler homes built after the Korean War, when refugees from northern Korea and elsewhere settled on the slopes of Namsan Mountain. Higher in the hills, design-conscious families live in sleek, stylish homes with panoramic views of the city below. The architectural diversity comes with demographic diversity. On the streets, elderly residents mingle with young couples and small children. Huam-dong’s urban ecology shelters everything from traditional markets and old fashioned snack stalls to hipster cafés and hot restaurants trending on Instagram. And unlike some of Seoul’s more gentrified districts, the neighborhood still feels like a neighborhood, an organically developed space where people actually live as well as visit, a minor miracle given its position between the up-and-coming Seoul Station area and increasingly trendy Haebangchon. The 100 Food Truck is a very scenic spot to enjoy a meal. Huam-dong is wedged into a steep valley on the southern slope of Namsan Mountain, just below Seoul’s old city walls. The steep hillsides and streams flowing down the mountain discouraged large-scale settlement. After Japan’s forced annexation of Korea in 1910, however, many wealthy Japanese settled in the area, which was near major institutions of imperial power such as the colonial central bank, the government-general, the railroad and the sprawling Japanese army camp at Yongsan. Their homes blended Western exterior elements with Japanese interior elements, including tatami mats. These homes, called “culture houses” or munhwa jutaek, reflected Japanese efforts to Westernize in the early 20th century. Though the Japanese left in 1945, many of their homes survive, easily recognized by their pointy, gabled roofs, often with dormer windows. The Seoul Museum of History believes over 300 of these houses remain in Huam-dong. Most are still homes, lived in by Korean families who took over the houses in 1945 or after. Some, however, have been repurposed. One such place is Anarchy Bros (T. 070-4069-6356), a popular café and pub near Sookmyung Women’s University Station combining Japanese woodwork with beam projections of music videos on the wall. The guest house Ji Wol Jang (www.jiwoljang.com) was the site of the specious villa of a Japanese railroad executive. After the Korean War, many families fleeing what is now North Korea settled on the slopes of Namsan Mountain, forming dense communities of narrow alleys and humble homes climbing the hillside, their layers connected by flights of concrete steps. 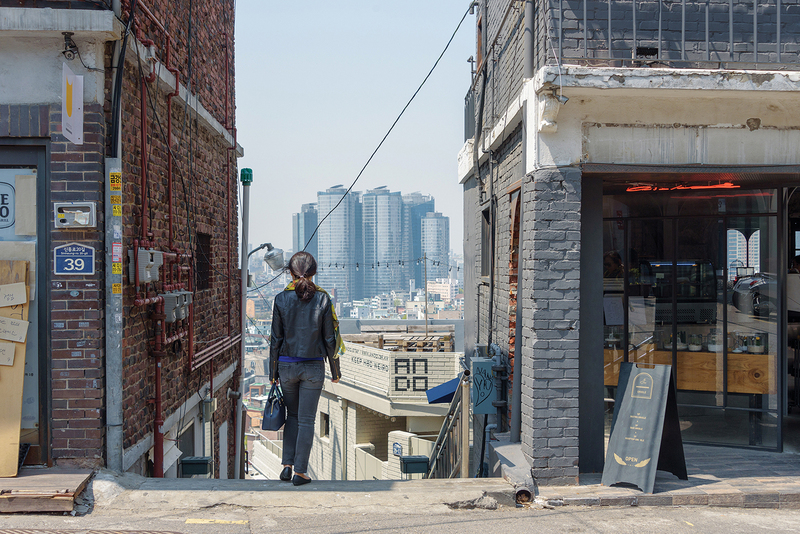 These neighborhoods, once common in Seoul, have largely disappeared from the city. In Huam-dong, however, they remain, even if some of the homes are being converted into cafés and bed-and-breakfasts. As you climb the hills, you might catch a glimpse of Namsan Mountain at the end of a narrow alleyway, or get a panoramic view of southern Seoul with its skyscrapers and rolling hills of homes and offices. 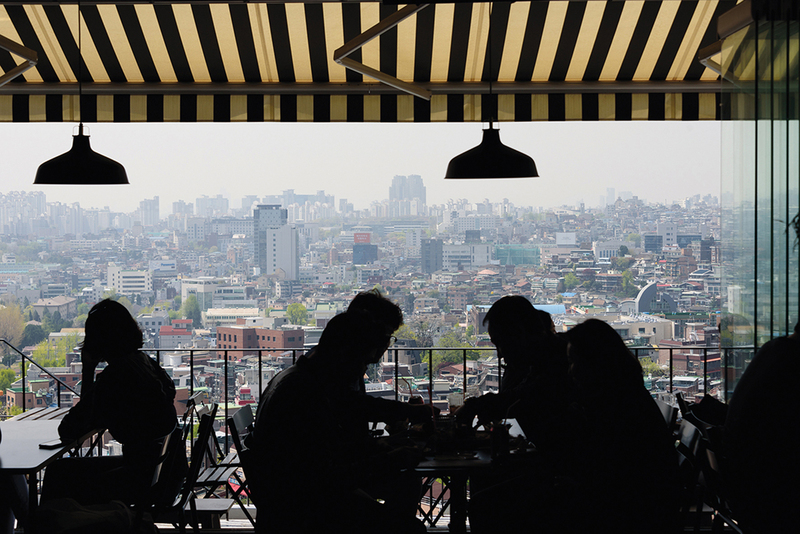 Naturally, you can enjoy the best views from the top of the hill — from Namsan Public Library, Yongsan Public Library, the old fortress wall or one of the eateries with open rooftops such as The 100 Food Truck or Oriole (see the Dining and Nightlife sections). Huam-dong has a vibrant outdoor market, too, one blessed with a dramatic location in the shadow of the futuristic Centreville Asterium Seoul apartment complex. 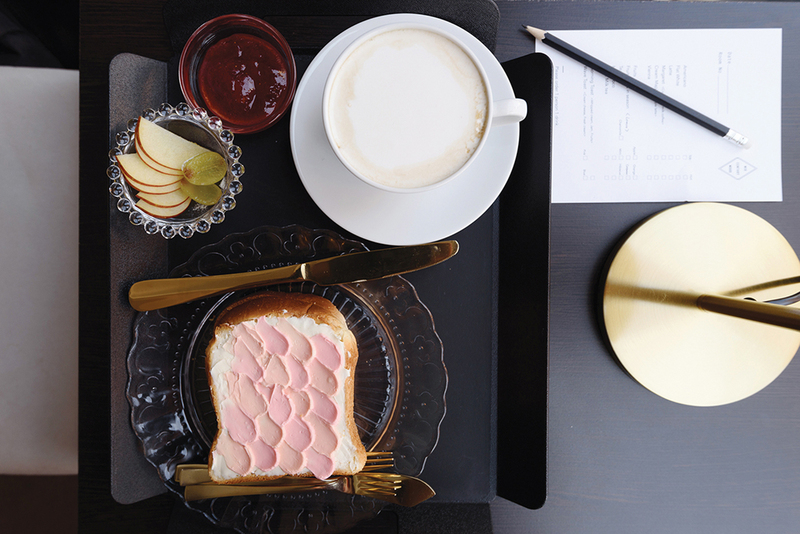 Mid Century Mood Coffee’s Wave Toast is an Instagram favorite. Run by achitectural cooperative Dosi Ogam, Huam Seoje is a shared study and library. Though Huam-dong is an old neighborhood, younger people find it an increasingly attractive place to live and work, drawn by the views, the central location, the cozy atmosphere and, of course, the relatively cheap rents. As new cafés and restaurants pop up throughout the area, word of the area’s charms is getting out, especially on social media. This has some locals worried. Haebangchon and Gyeongnidan-gil, the latter now a byword for gentrification, are within walking distance, after all. For now, however, Huam-dong remains mostly residential. Moreover, some of neighborhood’s more recent arrivals have taken pains to respect the local character and involve residents in their activities. The architectural cooperative Dosi 0gam (www.facebook.com/dosi0gam), formed by a team of young architects, opened its office in the neighborhood in an old house near Huam Market. It also operates two shared spaces — Huam Seojae, a shared study, and Huam Jubang, a shared kitchen where young people who live in the area can cook and share a meal. The cooperative sketches historic homes in the neighborhood, publishes a magazine and sponsors other cultural activities, too. Just down the alley from Huam Jubang Is Café Woorida (T. 070-8886-1210), a tiny renovated space run by a returned local that makes up what it lacks in size with friendliness and delightful concoctions that include double cream mochas, matcha cream lattes and even butter coffee. In a second floor overlooking the rotary in front of Yongsan Middle School, the café Sowolgil Milyeong (02-779-1992) offers more than just beverages and baked goods in an exceptionally cozy setting. Its owner, Kim Gyu-wan, a long-time resident of Huam-dong, has spent years documenting the neighborhood’s history. His maps and paintings adorn the walls of his café, which also serves as a local salon. Another lovely spot with some local history is Café Hooam-dong (010-2251-8232), on the main road to Yongsan High School. As its name would suggest, the owner really loves the neighborhood, and her café doubles as a local rest spot. The shop roasts its own coffee, too. The more artistically minded should stop by Wooyeon Sujib (02-778-0759), a craft space hidden in an alleyway below the old city walls, not far from the Hilton Hotel. The shop offers classes in a variety of crafts, including string art and lighting crafts. It also teaches classes at local schools. Young creatives are giving Huam-dong a bit of flair, too. A few houses up from Huam-dong Sejae is Mid Century Mood Coffee, a.k.a. MND Coffee (02-6449-0177), where the design takes its cues from mid-century American hotels. Its Wave Toast, served with lashes of pastel pink or blue cream cheese, draws the Instagram crowd. Man Two Ron (070-7776-3333), a macaron shop run by — sit down for this — two dudes, combines simplicity with a macaron line-up that includes classics and creative experiments such as sweet pumpkin and Injeolmi powder. Hidden in a hole-in-the-wall near Huam Market, I Like Question (ilikeq.co.kr) sells hand-crafted scarfs and hand towels. These shops, and others mentioned in this issue of SEOUL, add a bit of chic to Huam-dong’s earthy grit. Sookmyung Women’s University Station (Line 4), Exit 3. From there, you can catch Bus 202, which takes you to Yongsan Middle School Rotary.